Funeral programs are also known as memorial program, which are organized in the loving memory of deceased persons, by their mourning family members. Memorial or funeral program is one of the most important rites of person’s life cycle, however, the person, whose funeral it is, is not present physically in the world. The program is called in by the saddened members of family of the deceased. In the program, the loved & near ones, friends, relatives, and various other people (related to the departed person) are invited to celebrate the peaceful departure of the person. To invite guests or attendees, a card is sent to the loved ones, relatives, and friends of the deceased person. This very card is denoted as memorial card. And the sample of memorial card is referred to as memorial program template card or sample memorial card. Every card shop or online card store will show you their new and most-demanded samples before you give your nod to a design. This is what everyone does when he or she has to buy a set of cards for a family occasion. Scanning well before finally buying memorial program card is always suggested, as there are many important aspects, which should be taken care of. 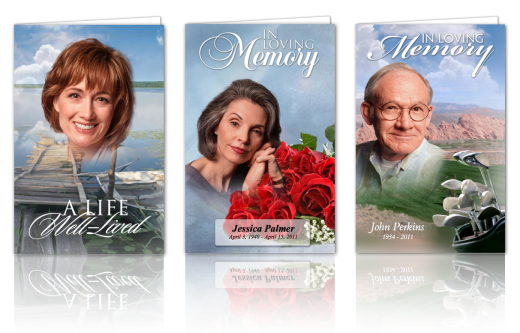 Simplicity – Memorial program cards are bad news messengers, therefore, they should be simple in design. They should not be equipped with very bright and contrasting colors. Bright colors will leave a bad impression on recipients of the card. Additionally, simple and sober texts and fonts should be used in such bad news bearer cards. Religious words – Every funeral card should have some religious verses written, sourced from the religious book of the religion that the deceased followed in his or her life. They help giving a peaceful and soothing message to the recipients of the cards. For instance, if the person followed the path of Christianity, there can be used verses of bible in the memorial program card. Similarly, if the person, who has passed away, was a follower of Hinduism, there should be used the shlokas of Gita. Favorite Words, Phrases, and Epitome of the Deceased – Using favorite words and sayings of the departed person in his or her funeral card is a must to include and not to forget thing. When designing the funeral cards, you should recall such things and place them in the card. 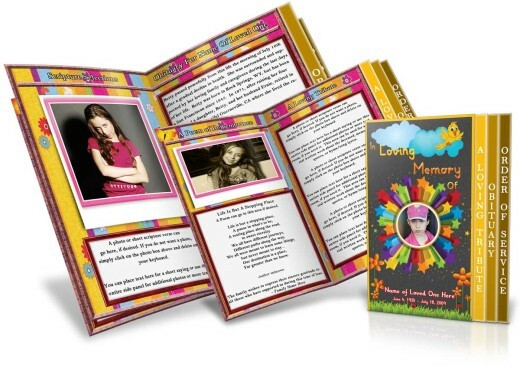 Find a Memorial Card Template – It is the first and the foremost step in the process of getting an exclusive card template. Many places are there, where you can get memorial card templates. The most common place is your local card stores. It is the conventional method of buying cards for family events and functions. In these stores, you can also get memorial card designs. Another mean, where you can memorial cards is the internet. There are so many websites that sell funeral and memorial cards. You can consider buying from them. In today’s busy lifestyle, making the buy over the internet is hassle free and less time taking. While arranging for the funeral ceremony, there are so many customs that you have to follow, and people hardly get that much time while arranging for the funeral event. Thereby, choosing to buy memorial program template online would be a wise decision. Editing the Template – Editing the template or sample card is the second step, once you have purchased it. You need to start editing from the first page of the template – which is – The Cover Page. The cover page consists of a cover image and a cover text or headline. You can use any picture you feel like, but the text should be unique and attractive. After modifying the cover image and the headline of the template, you should move to inner pages of the card, and add your details in it. You should put the address of your decided venue, and add some of the beautiful images of the deceased, to add more unique appeal to the card. Once done, you should take the print of the card, and send it to the people, you want to invite for the program.